Adult Pixie frogs from the southernmost part of their range get the largest, with males reaching lengths up to 10", and weighing up to 2 pounds! Females average much smaller, staying less than 5" in length. When fed a varied, correctly supplemented diet and not allowed to get obese, a lifespan of 15 years or more is not unexpected. With the exception of breeding pairs, it is best to house these voracious (and sometimes cannibalistic) frogs individually. Juveniles and small females can be housed in 5 or 10 gallon aquariums depending on how large your frog is. Large adult males will naturally need larger aquariums. Coming from Africa, these frogs thrive in temperatures slightly warmer than room temperature, that is in the mid to high 70s or even low 80s. This can be achieved through use of a low wattage red heat bulb or through an under tank heater of an appropriate size. Since heat bulbs can often dry out the air and substrate, the use of heat pads is much preferred for these frogs. While there is little conclusive data about the benefit of UVB lighting for frogs such as African Bullfrogs, in an enclosure taller than 6" the use of a 5.0 florescent light help aid the frog in processing calcium and other vitamins. Most keepers of Pixie frogs agree that coconut fiber is the ideal bedding, in that it holds moisture well, accommodates their need to burrow and dig, and has the lowest possible risk of impaction. In addition, Spangnum Moss can be added to the enclosure to help meet humidity needs, and provide more visual interest within the cage. Furnishings do not need to be particularly elaborate. Consider including live plants but be aware that the frogs will often rearrange the cage or topple items over as they see fit. When given the opportunity, these frogs can spend a considerable amount of time in water. To accommodate this, a water bowl should be provided that is large enough for the frog to sit in and soak if it so desires. A hand spray bottle should be used to mist the cage down as needed to increase humidity. Some keepers opt to treat their frog's water with water treatment to remove chlorine and help break down ammonia and nitrate. If you are concerned about your water quality, better safe than sorry! The feeding of Pixie frogs is certainly part of the appeal of keeping them as terrarium pets. However, indiscriminate feeding of large, inappropriate prey items can and will take a toll on your frog's health. The best diet for a Pixie Frog is a varied one. A feeding regime that includes appropriately sized crickets, mealworms, superworms, waxworms, silkworms, hornworms, as well as various species of roaches should make up a bulk of the diet. Larger and older frogs can be offered rodents occasionally, but these should be limited to prevent your frog from becoming obese. When feeding your frogs, all insects should be dusted in a quality supplemental powder, either a complete calcium, D3 and multivitamin mix or create your own supplement regime with calcium and D3 and a multivitamin about once or twice a week. Regular dusting is most important for young, fast growing frogs - older animals that are closer to adult size need supplements less frequently. In addition to live prey items, if you can teach your frog to feed off of tongs, you can also add various canned insects to the diet of your frog. This includes caterpillars, grasshoppers and snails. In addition, if the feeding of live insects is too unpalatable for you, canned crickets and canned worms are available, so you can maintain a variety for your pet. With most frogs, handling should be kept to a minimum, as they have fragile skin that should remain moist, and in general doesn't appreciate human contact. Furthermore, Pixie Frogs are ambush predators, and if you startle your frog this can result in an unpleasant bite. 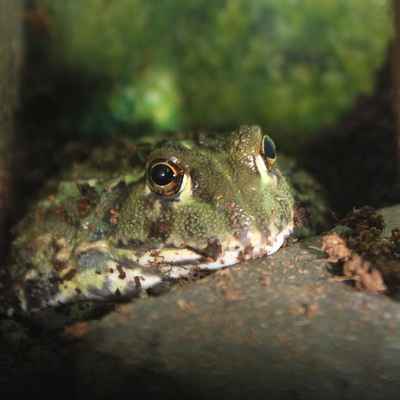 For these reasons, Pixie Frogs are best enjoyed from the distance of their cage.